8 1/8 x 10 in. This is a black and white image of two women working next to a printer and card sorter. The woman on the left of the image is Betty Jennings and she is feeding cards into the machine while Frances Bilas on the right is removing a set of cards. Written on the piece of paper affixed to verso side is "Picture 13 A close-up of the printer, the constant transmitter and the associated IBM equipment. 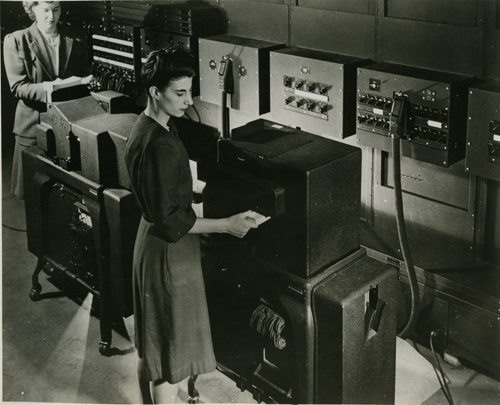 Miss Betty Jennings on the left is inserting a deck of cards containing initial data on which the ENIAC will operate while Miss Frances Bilas on the right is removing a set of cards which represents the result of the preceeding computation.